Yesterday I got an email announcing that the Lives of the First World War (LFWW) people had decided to let us beta test the Communities feature. This was a surprise as we (there is an active forum of beta testers) were still reeling under the shock of being told the price (yes, price!) of becoming a 'Friend' of the LFWW when it goes live in a couple of weeks. Quite a few people lodged a query about this, the record sets we are using are obviously the same as the ones on Find My Past and many of us already have subscriptions to that site. The prices are currently being touted at £6 a month or £50 a year. This is a lot to pay for record sets we already have access to and the only other selling feature was the ability to make 'Communities'. You might want to nip back and read my previous post about beta testing LFWW - it will make some of what I say next a bit clearer. Life Stories are the individual men who we are adding evidence to and from that evidence drawing out the facts. You can just add a 'story', that's meant for family members with personal information about a soldier, letters, photos, medals, all that kind of thing. These additions will still be possible without payment of any kind of fee when the site goes live - but the addition of 'evidence', that is attaching census records, military records, birth, marriage and death records and so on as provided by LFWW, will all only be available to 'Friends' who have paid the fee. The blub says that included in the services provided on payment of the fee we will have the ability to become Community Managers and create our own communities by grouping together Life Stories we are interested in. I can see an immediate use for this as part of the Barnsley War Memorials Project (BWMP) - a community for the whole of Barnsley which will include all the men (fallen and returned) who should end up on our Roll of Honour AND individual communities for each war memorial we have discovered. I decided to test out the Communities feature with one of the smaller War Memorials we have listed on the BWMP site. 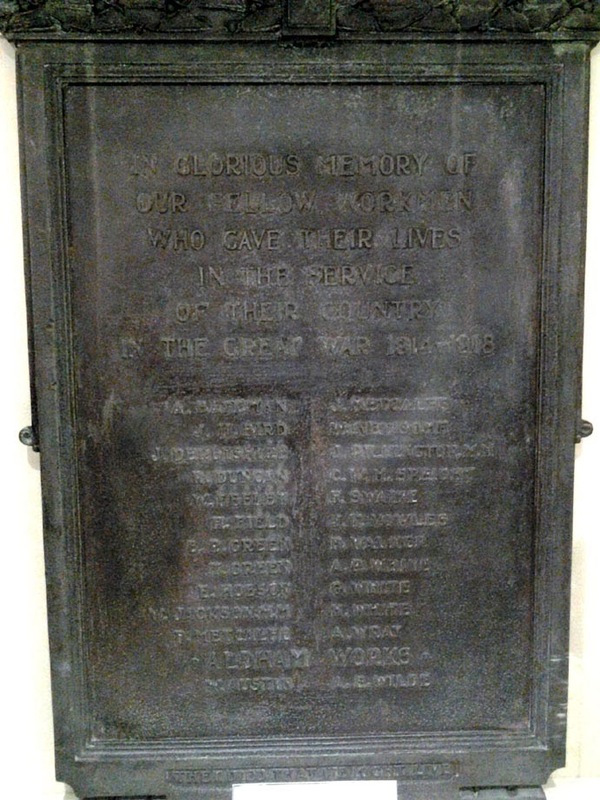 The Redfearn Brothers' Glassworks war memorial tablet contains just 24 names and I have already done some work on six of the men and found some information on another two. If you follow the link above you will see that some of the names are in blue, clicking on them takes you to additional information about each man. The OH's first cousin 3x removed, Reginald Leslie Duncan is on the memorial too, and he's one of my favourite WW1 soldiers as I seem to have spent a lot of time on him over the last few years. You can read his story here. One of the men, Benjamin Riley Green, even featured in a recent edition of Memories of Barnsley, the local quarterly history magazine. What the author of that piece hadn't spotted is that T Green just below Ben on the tablet is his brother Tom, another worker at Redfearn's Glassworks. Sad enough to lose two sons, but towards the end of the list are three Whites ... you guessed it ... all brothers and all killed. How absolutely dreadful for their families! Anyway, enough of that, this was meant to be a techie, beta testing post! I created a Community for the Barnsley War Memorials Project - it's just a case of filling in a few fields on the online form provided on the site - then I realised that they also wanted you to say what organisation you are affiliated to. Well in my case that's also the Barnsley War Memorials Project so I added that and was able to upload my favourite picture of the Barnsley Town Hall War Memorial - the one that forms the background to the BWMP webpages. It turns into a little icon on the page displays, see below. The blurb made a selling point of being able to do this - extra advertising for your organisation they said. Hmm, OK, I see their point and they did allow me to add a weblink going back to the BWMP main page. It seems that additional features will include the ability to upload community images (so I'm imagining uploading a photo of each war memorial) and the display of the communities on the Life Story pages. Well, that's a given surely, there wouldn't be much point otherwise, no-one but the manager would know about them if they didn't do that. They are also planning shared management, I guess this means I would be able to let GB and PS (other members of the BWMP committee) play on the site along with me - but would we each have to pay the fee? Could this be something we could charge to the BWMP, when and if we get some grant funding? Now there's a thought. Or should one organisation only have to pay one fee - they might be part time charity or volunteer staff for example, they aren't all going to be accessing the system at the same time? The Redfearn's Glassworks Community page (2 of 3) with men added. Then I created the Redfearn's Glassworks Community - and added the description that it was for all men who were on the memorial or who had worked at Redfearn's prior to enlisting. We might find reference to these men in the local newspapers or family members might know that Grandad worked at the glassworks. It seems a good way to keep a subset of men together. A community could be a football team, all the men from one street in a town or small country village I suppose, as well as a place of work as I have used it. As you can see from the screen shot above I have added the men from the war memorial to the community, it does run to three pages with up to nine men on each page. There is just one man missing, Fred Swaine, for some reason I just can't find his information on the LFWW site. I have put in a query to the administrators about this. The man with the little photo is Reginald Leslie Duncan, that's a picture from his obituary in the Barnsley Independent. Now that opens a whole can of worms about copyright - whenever I use something I've got from Barnsley Archives on here or on the BWMP site I am very careful to credit the Archives and provide a link to their website. It's not that easy to do that on LFWW, they seem to expect that people will only upload family photos which they will of course have copyright to. But most of the soldiers I have researched only have the fuzzy little images from the newspapers or De Ruvigney's list. I will have to be very careful to credit the Archives in the photo descriptions if I upload any more like this. It wasn't an easy task to identify each man from just an initial and a surname, I am currently feeling very guilty about assigning the OH's cousin RE the St Peter's, Doncaster Road, War Memorial Tablet which again only has initials and surnames. They are tricky. However with the added information that the men worked at Redfearn's prior to their enlistment once I had found a likely man on Soldiers Died in the Great War on Ancestry (where you can put place of birth or enlistment in the search) and cross-checked them on the Commonwealth War Graves Commission (CWGC) site which often provides additional information about next of kin there were only a few men where I needed all my genealogy skills to hunt down. W Austin, who worked at the Aldham Works site of Redfearn's Glassworks. That's on the edge of Wombwell so we aren't looking for a man who lives in Barnsley town centre. There were two William Austin's on SDGW, neither born in Barnsley, but both had enlisted there. Looking at their records on the CWGC using their dates of death and regiments to cross reference (Can you spot the problem with his service number? It took me a while!) I could straightway see that the man shown this SDGW entry's next of kin was his brother Thomas who lived at Stairfoot, which is on the main road out of Barnsley going towards Wombwell. A W Austin also appears on the Ardsley Christ Church memorial (we haven't got a photo of that one yet, but we do have a listing from the Barnsley Chronicle of the names on the plaque). Ardsley would have been the parish in which William and his brother Thomas were living. The CWGC gives us an address so I could then look for William and Thomas in the 1911 census. The Find My Past site used to allow address searches, but for some reason they aren't working properly at the moment which is annoying, but as there are only a few William Austins in Barnsley it didn't take me long to find the entry shown here. Ok, it's not the same address, but consulting a local map (or local knowledge) tells us that it is quite close by. The names of the men and the place of birth of William, Heanor in Derbyshire (spelt here without an H, typical of the Barnsley accent!) leads me to conclude I have the right men. You will see that William is a Colliery Labourer but his brother Thomas works as a Labourer in .... a Glass Bottle Works. There's the connection. The other William Austin turned out to be still living with his mother in Chesterton, Staffordshire in 1911, he must only have enlisted at Barnsley, and collected a wife from the area later - so on balance of probabilities I went with the lad from Derbyshire. Lives of the First World War is populated with data from the WW1 Medal Cards; provided a man served overseas his record should be there and they are promising to add other men, nurses and associated civilians at a later date. Searching for William Austin brought back 385 suggestions as you can see, I did try filtering them by regiment but my man didn't appear. Service numbers are not unique, they repeat in different regiments, but at least the choices are usually a lot less. As you can see above the reason I couldn't find my man in a search for William Austin is that he was filed as Willie! Well, now I know! Finally I added him to my communities, both of them, the overarching BWMP one and the one for Redfearn's Glassworks. Job done. Mostly anyway, all bar the elusive Fred Swaine. I believe we have a few more days before the site is due to go live, but I have an Open University essay to write and an exam to revise for so I don't know how much more I will be able to do on the LFWW site before they start charging to access the 'evidence' record sets. I do think the process of using the site is quite complex - and I'm a genealogist with over 20 years experience and a bit of a techie geek to boot. I'm not sure what a regular family member out to record the story of their great uncle or grandad will make of the site. I suppose we'll just have to wait and see.